Deed, dated 17 Nov 1806, Thomas Blennerhassett to Samuel Morton, [LR] book 587, p.126, no.396928. Deed, dated May 1810, Thomas Blennerhassett of Cork to Sir Frederick Flood, [LR] book 610, p.465, no.427934. 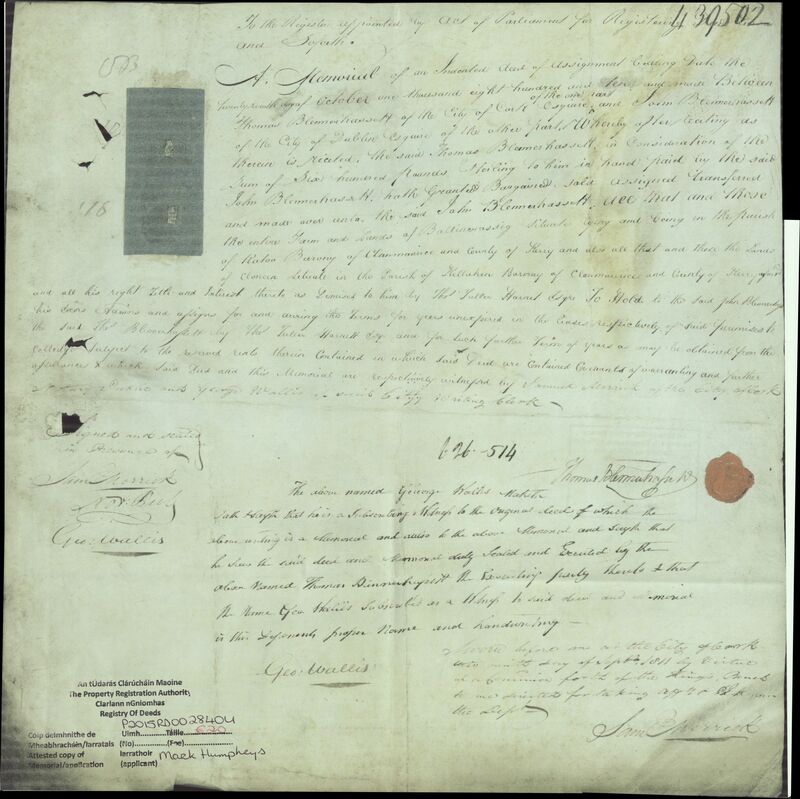 Deed, dated 27 Oct 1810, Thomas Blennerhassett of Cork to John Blennerhassett of Dublin, registered 9 Sept 1811,	[LR] book 626,	p.514,	no.439502. See memorial. Thomas Blennerhassett described as Captain in the Kerry Militia at baptism of his daughter in Tralee in 1801.
of Tralee and of Cork. Captain in the Kerry Militia ("Kerry Legion" corps) at Tralee. 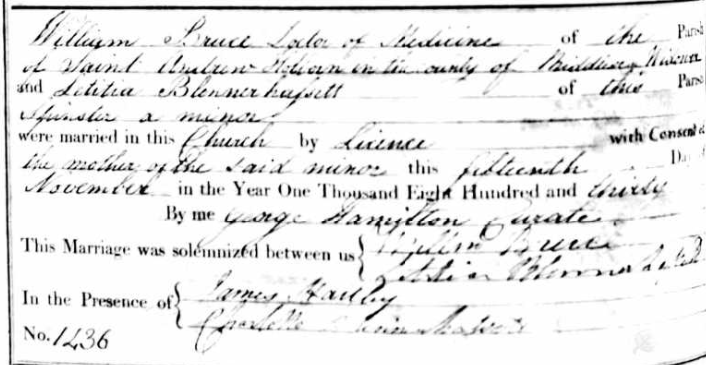 He mar, licence 30 Apr 1791, to Mary Blennerhassett [born 1767]. Children bapt at Tralee 1792 to 1801. He is described as Captain in the Kerry Militia at dau's baptism 1801, still living Tralee. He was apparently the eldest surviving son after his father died 1804. He would be "Thomas Blennerhassett of Tralee" who is party to Deed of 31 Mar 1806, relating to his sister Letitia. He moved in 1806 to Cork. He is described in [Deed, 17 Nov 1806] as Thomas Blennerhassett of Cork, formerly of Tralee, Captain in Kerry Militia. He died 19 May 1822, at Brussels, Belgium (NOT 17 May, NOT 1825). See notice in Freemans Journal, 31 May 1822. See notice in Dublin Weekly Register, 1 June 1822. (todo) See notice in Correspondent (or Dublin Correspondent), 1822. (todo) See Sligo Journal, 5 June 1822. Mary is listed in 1841 census as living with her (possibly deceased) daughter Letitia's family at Inver Villa, Stamford Brook, London. 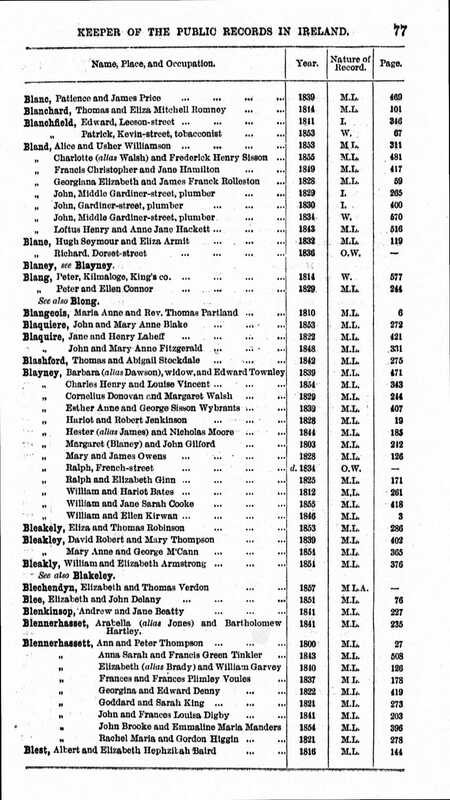 Mary is listed in 1851 census as living with her deceased daughter Letitia's family at 15 Kensington Crescent, London. She died 28 Dec 1859, Kensington Crescent (dau's family's house), age 92 years. See notice in Dublin Evening Mail, 2 January 1860.
bapt 10 June 1792, Tralee, see entry in [Tralee Protestant par records]. she died 1847, age 53 yrs. died soon after arrival, 1819.
mar 2 Nov 1840 to William Henry Garvey and had issue. died in infancy, bur 18 Oct 1801.
bur in old Protestant Cemetery (or English Cemetery) at Livorno (Leghorn), Tuscany, Italy. died without issue, 17 Aug 1825, age 17, at Boulogne-sur-mer, France. She was a "minor" at mar 1830. Unclear what age this implies. This may imply born post-1809. Same name as aunt Letitia. Thomas must have been fond of his sister. to Dr. William Bruce and had issue. 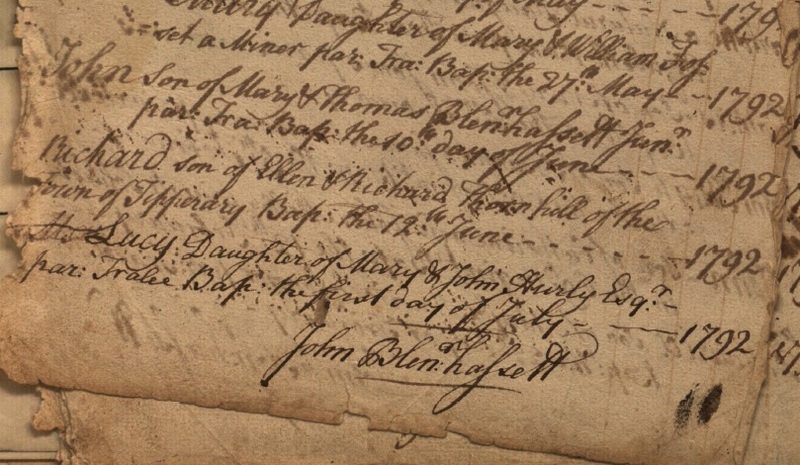 Baptism of John Blennerhassett in 1792 in Tralee. This is a bit of a mystery. The Rector, who signs his name at the bottom here, is Rev. John Blennerhassett. He is baptising his own grandchild. Except he names the father "Thomas Blennerhassett Junior". Note that Rev. John had a brother Thomas. Signature of "Thomas Blennerhassett of Tralee" in Deed of 31 Mar 1806. Signature of Thomas Blennerhassett in [Vestry Minutes Books, Tralee church] in Apr 1806. Signature of Thomas Blennerhassett in [Vestry Minutes Books, Tralee church] in Apr-May 1806. Signature of Thomas Blennerhassett in [Vestry Minutes Books, Tralee church] in May 1806. Signature of "Thomas Blennerhassett of Cork" on memorial of Deed of 1810. Capt. Thomas might have left the army in 1806 and become a merchant in Cork. He might be "Thomas Blennerhasset", merchant, Morrison's Island, listed in Cork in [West's Directory of Cork, 1809-10]. There is also a "Blennerhasset & Robinson", merchants, listed on Mannix St (now Exchange Street / O'Connell Square, see map). Note there is no Blennerhassett person or business listed in Cork in [Holden's Directory of Cork, 1805 or 1809]. Morrison's Island, Cork, on 1801 map. 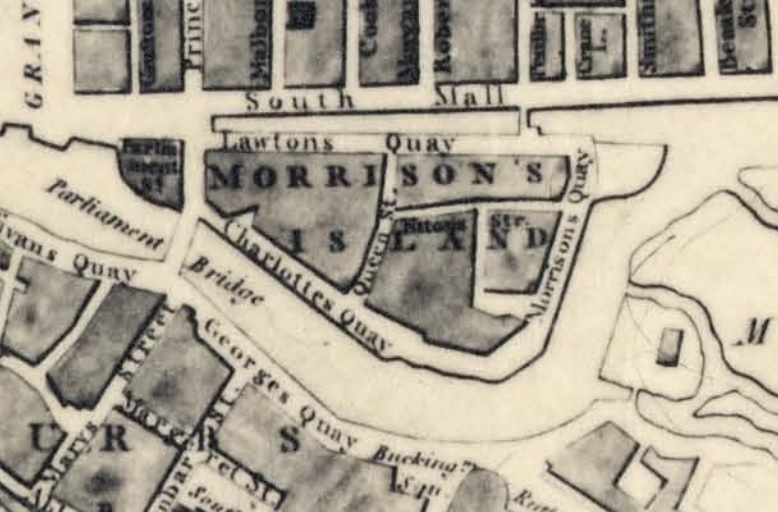 This is now the area W of Morrison's Quay (see modern map).